Why did Bron come to London from Australia? So she could go to Paris for the weekend! 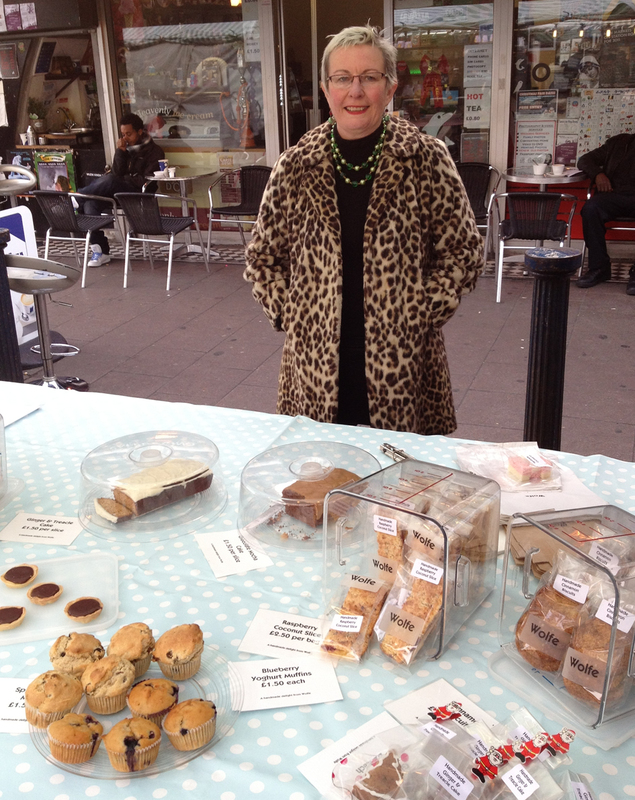 Bron tells us about her love of travel, Brixton – and selling cakes and biscuits on her Wolfe market stall. 1. Like many Australians, you like to travel. How did you end up in London? I came over here in 1985 because I wanted to go to Paris for the weekend! In Australia you’re so isolated – it takes so long to get anywhere. So I loved the idea that I could live in London and be somewhere with different architecture and language in such a short hop. I bought a one-way ticket to London and stayed with a friend – we’d go to Paris, stay in a cheap hotel, and spend a shedload on earrings! 2. So would you rather live in France? We used to have a house in south-west France, but we sold it a couple of months ago. And I haven’t been to Paris for years! But I love London. No matter what you’re interested in, you can find it here – you just need to look for it. 3. And have you always lived in this area around Brixton? Yes – I find Brixton endlessly fascinating, endlessly changing and evolving. This Friday food market [on Station Road, where this interview took place] is just part of that. The shopping is amazing – like all those shops on Electric Avenue where you can buy 2kg bags of cinnamon! 4. So how do you find being a market trader? I wasn’t sure about it at first, but I’m really enjoying it. Having a market stall seems to give you a licence to talk to anyone and everyone! It’s a really nice group of people here. But if you’d told me a year ago I’d be a stallholder at Brixton market I’d never have believed you! 5. Because your ambition is to open a café? Yes – I gave up my job at a shipping company to do this. I really hated the job, and I thought the worst that could happen would be that the café would fail. I never thought it would never take off in the first place! I’ve had problems finding a site – most of the places never come onto the market, and those that do have a hefty premium. But I’m still looking! 6. Is that why you joined Makerhood instead? I got the email about Makerhood and joined up, thinking it could be a small income, though I never thought I’d sell much directly, as it can be difficult to sell cakes online. But it was through Makerhood that I heard about this market and got this stall, and now I’m selling to a couple of café s, so hopefully it will build up. And Makerhood has been really good for meeting people and making good contacts. It’s nice to have a web of other local makers to interact with. 7. Apart from finding a suitable site, what’s the biggest challenge you face? My biggest worry is making the right quantities of food to sell. Some of the stuff that’s left over goes to an old people’s home for their tea on Sundays, and my partner Giles takes some to work on Monday morning – he’s currently the most popular person in the office! You can order Bron’s yummy savoury muffins, cakes and biscuits at http://brixton.makerhood.com/wolfe. She also has a stall at the weekly Friday food market and the monthly makers’ market (second Saturday of the month), both on Station Road, Brixton.